Peter Collins thrilled a massive crowd at Silverstone by becoming the fourth English driver that season to win a grand prix, leading home team-mate Mike Hawthorn by 24 seconds. 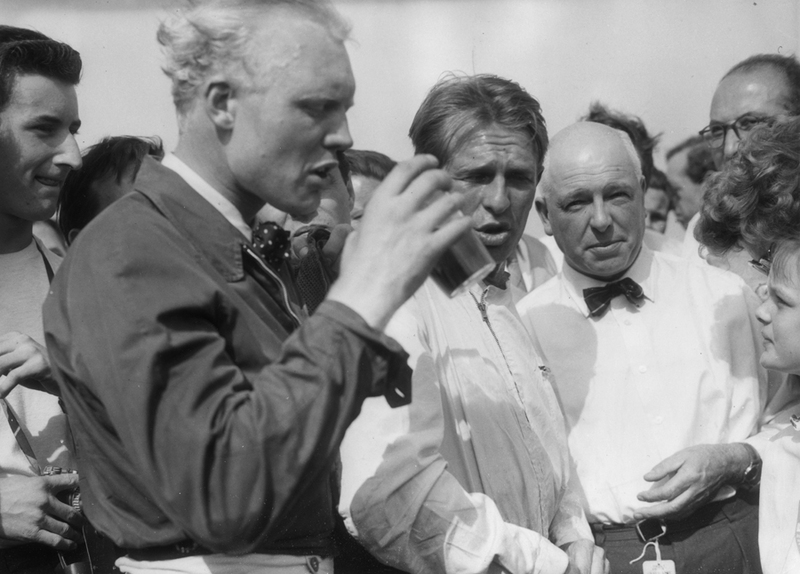 Within a fortnight Collins would become the latest in a depressingly long line of Ferrari drivers to lose his life. With British manufacturers and drivers dominating, and with Hawthorn and Stirling Moss joint leaders in the drivers' championship, a record attendance was guaranteed, and when Moss put his Vanwall on pole he was odds-on to take the race. But Collins took the early lead while Hawthorn settled in behind Moss, Ferrari's tactics being to hope the Vanwall would fail trying to match Collins' pace. On the 25th lap the plan worked as Moss' car spluttered into the pits and was immediately retired. But Hawthorn was unable to get close to Collins, and his own chances ended when he had to pit with oil problems. He resumed more than a minute adrift, and while he clawed back half that time and in so doing set the fastest lap, he was still 24 seconds adrift at the finish.